The wireless earphones were unveiled as part of the iPhone 7 launch last week. Since the iPhone 7 was unveiled, people have been sharing their feelings on its new features, like its missing headphone jack or new wireless AirPods. Mobile accessory company, Spigen, has created a $10 strap designed to keep the AirPods together at all times, and they're stocking it just on time for the iPhone 7's release in October. Wow. You've got to hand it to them. That might just be the most simplistic and ingenious add-on we've ever seen. Despite the product not being out yet, the reviews are already in, and they are ridiculously tongue in cheek. Some have called it "possibly the coolest thing since... String," while others have called the design innovative. 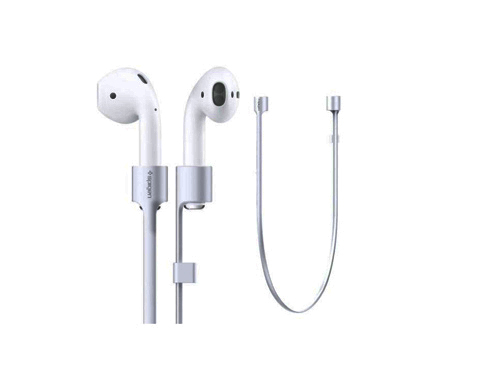 However, Monish Naidu topped them all, writing: "To make a wire shortly after having these "Air"Pods is brilliant within itself. Who would have thought a wire could do more than just send signals from your device to your earphones." He adds: "Fair warning though, the strap doesn't come with the Apple Airpords. But likewise, the Airpods don't come standard with a strap. The Titanic comes to mind. Where would Rose be without her Jack? Probably fumbling around in her purse." See his and other joker's reviews in full here.